The University of New Brunswick will be hosting memorial events in Fredericton and Saint John to mark the National Day of Remembrance and Action on Violence Against Women and to remember the 14 women killed during the Montreal Massacre on Dec. 6, 1989. This year marks the 27th anniversary of the murders of 14 young women at the Ecole Polytechnique in Montreal. Many of these women were engineering students and their lives were taken in an act of gender-based violence. 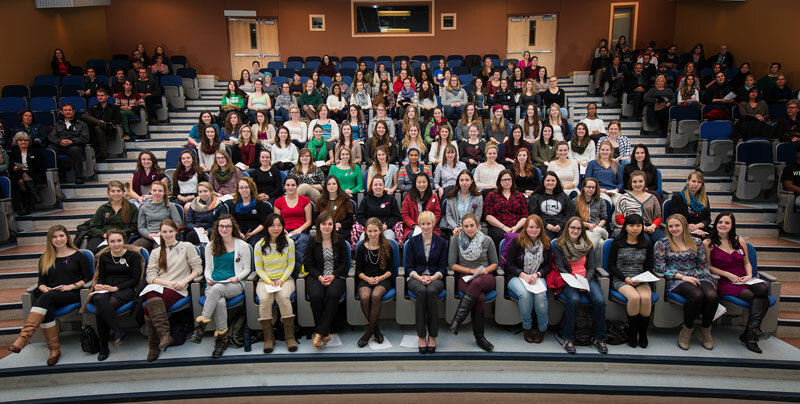 The Fredericton ceremony is being hosted by the UNB Women in Engineering Society. Co-Presidents Leah Edmondson and Hannah Meneley said the day is about remembering the victims of the massacre, reflecting on violence against women, as well as looking to the future. “By hosting this ceremony we are honouring the memory of those 14 women and helping to ensure their stories are never forgotten,” said Ms. Edmondson. “We can also use this as opportunity to talk about how to encourage more women to enter careers in science, technology, engineering, and math,” added Ms. Meneley." The Saint John ceremony is being planned in a collaboration between groups from UNB Saint John and the greater Saint John community. Dr. Chris Doran, a professor of sociology at UNB Saint John has been involved with planning annual commemorations for many years now and is a member of a committee that organized this year’s events. The Fredericton ceremony will be held at 2:30 p.m., on Tuesday, Dec. 6 in Dineen Auditorium, Head Hall. A reception will follow in room C-24, Head Hall. This ceremony will feature presentations from Rina Arseneault, associate director of the Muriel McQueen Fergusson Centre for Family Violence Research at UNB, Christine Plourde, a fellow of Engineers Canada and the chair of the committee on diversity and inclusion at Association of Engineers and Geoscientists of New Brunswick, and Dr. Lori Leach, a UNB history professor and who also works with the Government of New as a strategic Initiatives Manager with the department of post-secondary education, training and labour. The ceremony in Saint John will be held at 7 p.m., on Dec. 6, at the UNB Grand Hall, King’s Square, Saint John. Speaking at this ceremony will be representatives from the Sexual Assault Response team, the Female Empowerment Movement, and the Coverdale Centre for Women. They will talk about issues affecting women in Saint John and the surrounding area. Musical offerings will also be provided by soloist Tricia Wilson. Saint John participants are invited to wear a purple ribbon as a commitment to end violence against women. The evening will end with a short candlelight vigil walk from the Grand Hall to King’s Square to commemorate the 14 lives lost on Dec. 6, 1989. Both ceremonies are open to the public and all members of the Fredericton and Saint John communities are invited to attend.